Do you have missing teeth? 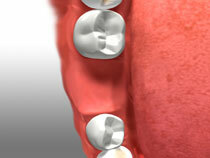 Looking for a suitable tooth replacement option? If so, a dental bridge may be what your smile is looking for. 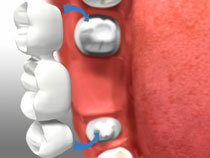 A dental bridge is made of up of one or more artificial teeth that fill in the gaps left by missing teeth. The artificial teeth are strong, durable, and attractive looking since they blend in with your neighboring teeth. And unlike traditional dentures which can slip out when speaking or chewing, a bridge is anchored in place by adjacent remaining teeth. This allows you to speak and smile with complete confidence. 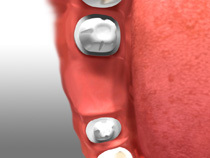 Besides replacing missing teeth, a dental bridge helps to stabilize nearby teeth. When a tooth extracted or falls out, the remaining teeth can become weaker due to the gap left behind. Oral health problems can occur as food debris and bacteria can become stuck in the gap. A bridge fills in the void while helping to enhance the strength of your bite. As a result, a bridge helps to improve your speaking and chewing ability. Dental bridges are made of high-quality porcelain material which makes them extremely pleasing to the eye. Porcelain is well-suited for its strong, durable, and aesthetically pleasing qualities. A bridge can last for years with proper care and can be easily restored if it becomes worn down. To place a dental bridge, the dentist will have to shave off a small amount of your adjacent teeth surfaces. 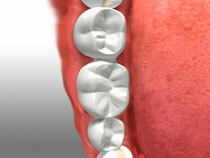 This is done to ensure that the bridge fits properly and creates the best looking results for your smile. While a permanent bridge is being made, you will be given a temporary bridge to wear. Once the permanent bridge is ready, you will return to our office to have your temporary bridge removed and your permanent bridge placed. Curious if a dental bridge can help your smile? Contact Uptown Dental Gig Harbor to speak with us today.